Lock in a great price for Sydney CBD Market Street Apartments – rated 8.7 by recent guests! 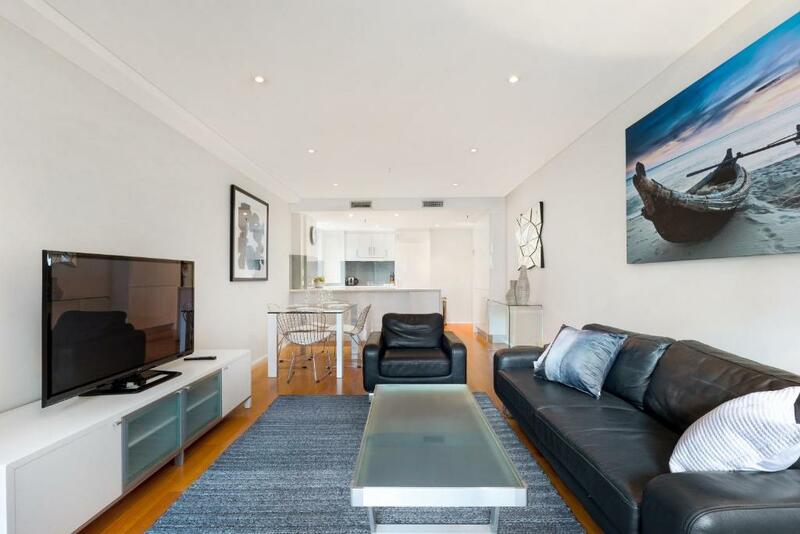 Sydney CBD Modern Self-Contained Two-Bedroom Apartment (36 MKT) offers accommodations in Sydney, just 1,650 feet from Darling Harbour Sydney. The property is 0.6 miles from Capitol Theatre and free private parking is available. There is a dining area and a kitchen as well as a private bathroom. A flat-screen TV and DVD player are provided. Circular Quay is 0.8 miles from Sydney CBD 36 MKT, and Overseas Passenger Terminal is 0.9 miles from the property. The nearest airport is Kingsford Smith Airport, 5 miles from the property. When would you like to stay at Sydney CBD Market Street Apartments? This apartment has a toaster, dishwasher and sofa. This two bedroom apartment comes complete with towels and linen, modern furniture, fixtures and fittings including WiFi, plasma TV, washing machine, dryer, dishwasher and air conditioning. It contains everything you will need for both a short-term or long-term stay. 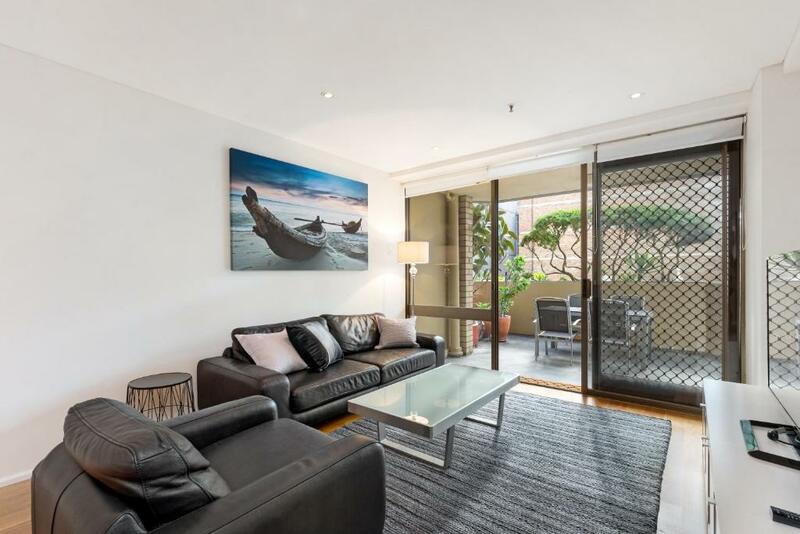 This furnsihed two bedroom apartment is located on the corner of Market St and Clarence St and within walking distance of the Sydney Opera House and Sydney Harbour Bridge. Surrounded by major shopping malls including the Queen Victoria Building and Westfield Shopping centre located on Pitt street, restaurants, cafes and bars the apartment is ideal for both the corporate or holiday traveller. 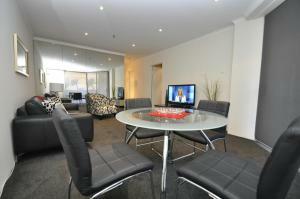 The apartment is also within walking distance to Darling Harbour and Sydney Aquarium, Cockle Bay and King Street Wharf. House Rules Sydney CBD Market Street Apartments takes special requests – add in the next step! Sydney CBD Market Street Apartments accepts these cards and reserves the right to temporarily hold an amount prior to arrival. Please inform Sydney CBD Market Street Apartments of your expected arrival time in advance. You can use the Special Requests box when booking, or contact the property directly using the contact details in your confirmation. Dislike the part that you have to pick the keys for the property at another location, luckily we had friends who live in Sydney and they went above an beyond to help us get the keys. So be prepared for that. I think a greater solution would be to have some sort of a keyless entry system. This is where I am highly unhappy. When there is an issue with a property in the US, they send someone right away to fix an issue. Well, don't expect that here, 4 days into our stay the air conditioning unit broke, the internet broke and we were miserable in the heat! The apartment got super hot and it was unbearable, I called the individual who handles the maintainince of the property. We played phone tag on the phone first, then when we finally spoke he advised me what I need to do to fix on the internet and then how I should fix the AC. I don't have an issue fixing an internet, so I did fix that on my own. However, the AC unit not so much, I left a message for the individual letting them know that we are unable to fix the AC Tuesday night, Wednesday night it was public holiday so there was no response, so now here we are Thursday and Friday we checkout and the AC is still not fixed. The response I got was "someone will come on Monday, since you are departing on Friday" in other words go buggar off we don't care if you were damn hot with 3 kids. I sent an email requesting something needs to be done for the inconvenience that has been caused, the response I received was when you come to the city we will give you a FREE night! No thank you, I do not want a FREE night more like I would appreciate credit for my stay and the inconvenience of not having AC. Hate to be rude about this and complain, but I feel like this is necessary for people to know. First of all let me start by saying that Adrian was very accommodating in letting us check in early due to the fact we were moving from US to Sydney and we had 3 children ages 16, 13 and a 2 year old and 7 bags along with our flight had landed at 7am in the morning after flying for 22 hours. The building itself and the apartment were top notch and clean. 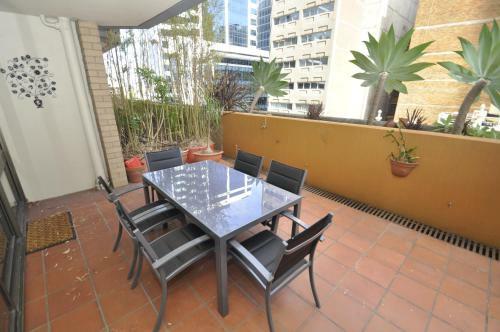 The area where this unit is located is within walking distance to everything, shops, grocery, parks, look to your left from the balcony you will see Darling Harbour which is literally a 5 min walk. There is so much right at your finger tips that we LOVED the aspect of this. My kids who are teenagers loved staying here!!! You are able to get anywhere from this location: to Tarronga Zoo, to Cicular Quay, to Mosman, to Cremone, to Manly beach and much more. There is access to Ferry, Train and Bus right at your finger tips. We have enjoyed our stay in this apartment. It is a good size, nicely decorated and well equipped.